The latest puzzle sensation for Apple iPhone is set to appeal to gamers who are blind or visually impaired, by using sound-based gameplay married with touchscreen control. 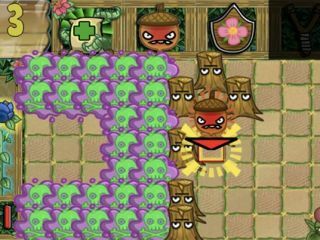 Stem Stumper is based around a standard puzzle-game template, in which the player guides a funny-looking plant creature around various obstacles such as angry tree stumps or clouds of nasty weed killer, in order to find bags of fertiliser. Drag your finger along the screen to create a path and you will see and hear clues which let you know when you have come across something important or useful. "Come play Stem Stumper, a blind-accessible puzzle game for the iPhone and iPod Touch," reads the iTunes blurb. "A dynamic layered soundtrack guides Mimea the vine through 100 brain-teasing levels. Use sling shots, sprinklers and Angry Acorns to open paths for her to grow. Use the right combination to rack up points and prove once and for all you're smarter than a 6th grader. "The inaugaral game of Ananse Productions, Stem Stumper is built from the ground up to be enjoyed by both the iPhone's burgeoning blind community and fully sighted players around the world." The real innovation here is the option to play in "sonar mode" in which the visuals disappear from the screen and you are forced to focus and play the game exclusively via the sound effects emerging from your phone. Stem Stumper supports Apple's VoiceOver, which reads out the instructions for each stage, for those visually impaired or blind gamers.